Major League Fishing® (MLF) crowned its third-ever General Tire World Champion Saturday, March 2 on Lake St. John in Vidalia, Louisiana, and fans won’t have to wait long to find out who it is. Despite adverse weather for part of the week, the fishing conditions were favorable and bites were plentiful as MLF’s top 12 anglers in two-year point standings competed on the waters surrounding Vidalia over six days of competition. As a part of the partnership with the City of Vidalia and the State of Louisiana, the Louisiana Seafood Promotion and Marketing Board coordinated with Vidalia area restaurants on a dinner for MLF anglers, staff and local officials mid-week. The meal featured hundreds of pounds of crawfish and shrimp along with etouffee, king cake and other Louisiana fare. The 12 MLF Cup anglers competing in the World Championship are no strangers to the state of Louisiana or the Vidalia area: this trip marks Major League Fishing’s third time in its seven-year history to fish in Louisiana-the first was the 2015 Challenge Cup, which was filmed in Shreveport, and the second was the 2018 Challenge Cup, which was fished in the waters surrounding Vidalia and nearby Natchez, Mississippi. MLF pro Edwin Evers of Oklahoma was the 2015 Challenge Cup Champion and went on to win the 2016 Bassmaster Classic. The 2018 Challenge Cup was MLF Pro Kevin VanDam’s record-setting third Cup win. 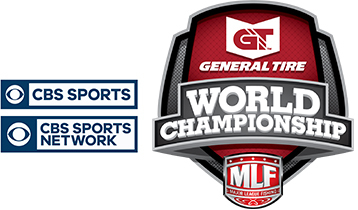 The 2019 General Tire World Championship will air on CBS Network for the third consecutive year, with re-airs each week on CBS Sports Network throughout the week. Beginning June 22 and culminating with the Championship Round airing July 27, a one-hour episode will premiere each Saturday during the six-week run at 2 p.m. EDT. The Major League Fishing television series features some of the biggest names in professional bass fishing and includes Bass Pro Tour anglers, Bassmaster Classic champions, Angler of the Year winners and title-holders from both the Bassmaster Elite Series and the FLW Tour. Anglers competed across the lakes surrounding the area in six days of competition, culminating with the crowning of the 2019 General Tire World Champion. The top 12 Cup anglers, based on their cumulative two-year final point standings of the 2018-2019 Cup events, competed in the same format as the 2018 Championship (won by Greg Hackney). That format saw the top angler from each of the first two rounds immediately punch a ticket to the Sudden Death Round rather than making all anglers compete in Elimination Rounds. This competition marks the last year for this specific format; with the creation of the Bass Pro Tour and addition of new anglers in 2019, the 2020 World Championship will see 16 competitors rather than 12, with a completely new format and qualification process.